Today will be the first in a new series where I will be featuring fellow Potter crafters! I couldn’t have found a better DIY Harry Potter craft to start with… the idea to create dementor hands is so cool! Our craft this week comes from All Things Crafty by Mieljolie. Be sure to check out her site for other awesome crafts, including other Potter crafts! Read more about her and her site below. I’ve started my crafting blog (mieljolie.blogpost.com) to share my work and experiments in hopes that they will inspire others to create things. It branched off into three different entities: Tabistry.blogpsot.com (making costuming and other things out of can tabs), Knitty-witty.blogspot.com (Adjustable Loom Knitting experiments) and this general craft blog (that is currently being overrun with Harry Potter projects). Through posts and tutorials/patterns aimed at simplifying and speeding up the learning process, I share projects, skills and techniques that are hopefully unique, easy and fun to do. Our Harry Potter crafting journey started in about 2008. My mom, my daughter, my sis, and I started doing themed craft swaps and quickly got hooked on recreating the magic from the books and movies. Five years ago we started doing an annual HP themed birthday party for my sis and my daughter near Thanksgiving. We decorate the house for a weekend, attend classes and make themed feasts. We also do a craft swap exchange at that time themed to the Hogwart’s year. We each have different styles and preferences, but we enjoy making projects together and for each other. These projects have inspired many of the items we offer in our Etsy store. Though I do enjoy it, I have discovered that a lot of time and energy goes into putting together useful tutorials and patterns, not to mention answering questions and assisting others. This draws me away from making new items. To balance this so I may still make what I enjoy and remain a contributing member of my family, I do ask for a reasonable amount of compensation on certain more complex projects to satisfy my family and keep me crafting. My goal here is not to get rich, or even make a living from my sales, but to share my knowledge in a realistic sustainable manner. Money made from each sale goes to cover my time creating tutorials and directly helping others learn new skills. And, whatever portion is left of the earnings from every purchase goes to my daughter’s college fund. What is now trendily called “upcycling”, making trash into treasure, is something I’ve been doing since I could hold a crayon. I was making illustrated bookmarks from used envelope corners before I could even read. As a child I was much more interested in using any old found object to make accessories and furniture for my dolls than buying that mass produced store-bought stuff. Though, I’ve been collegiately trained in working with various mediums from pencils, paints, clay, metal to fabric, to this day when inspiration strikes I’ll work in just about ANY medium including household products, food containers…heck, food itself! In my “spare” time away from crafting, I’m a work-at-home Graphic Designer/Illustrator Mom who enjoys attending ren faires, swing dancing and secondhand bargain hunting. 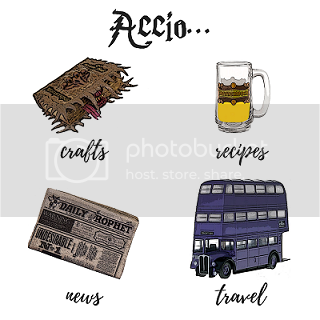 Previous article12 Harry Potter Back to School Must Haves!